The new Patrol HD Wireless NVR System brings you 1080p Full HD quality video. 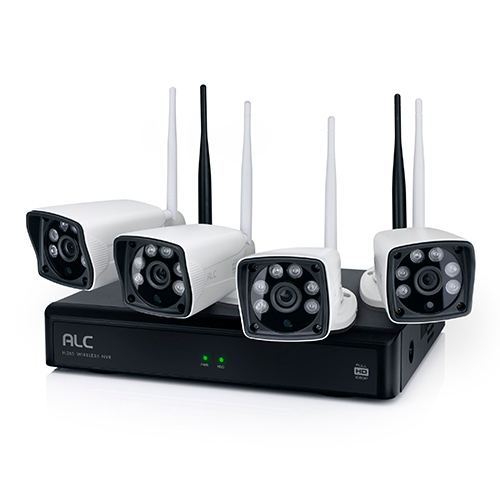 The four outdoor 1080p all metal wireless cameras stream video continuously to the NVR.The cameras come pre-paired to the NVR so setup is just plug and play. SimpleEthernet connection to your router provides secure video transmission to your smartphone while away. 85’ of night vision and infrared filter for true daytime color provide excellent images day or night. The free Patrol HD app keeps you connected 24/7/365. ALC’s Patrol HD Networked Video Recorder (NVR) produces 1920 x 1080 HD resolution for clear video streaming, playback and recording. View Live and Recorded video using your smartphone or tablet from anywhere in the World. The free Patrol HD app for Android and iOS gives you access anytime. The free ALC Patrol HD app sends alerts to your smart phone or tablet when your camera has detected an “event”. Connect your NVR to a Monitor or TV to provide Live viewing of all your cameras. Cameras stream continuously to the NVR for 24/7 Live viewing on a connected Monitor or TV. Video can be recorded continuously or by Motion Detection to the included 1TB Hard Drive. Motion Masking allows you set areas for the camera to “ignore” motion such as tree limbs moving. No need to run cables from the camera back to the NVR. Cameras simply need to be plugged into a standard AC outlet and video is delivered via Wi-Fi. 6 high-power Infrared LEDs allow you to view potential security risk to your family or business, even in the dark up to 85’. Feel confident positioning these metal housing, weather-proof cameras outdoors, even in inclement climates.